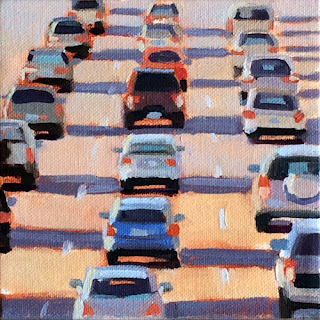 Driving North on the 101 Freeway, I liked the warm light of sunset and the rhythmic patterns of the cars on the freeway. Although everyone hates to commute, there is beauty in the repetitive patterns, shapes and colors. I like the way my eye bounces around from warm to cool colors and shape to shape.